is expected to increase at a rate of about 18% per year through 2005. The actual procedure occurs as follows. Under local anesthesia, the first step for many implant procedures is the exposure of the bone where the implant is to be made. This is followed by placement of the implant into the exposed jawbone. Implants that are placed in the bone are called endosteal implants and are made of titanium or a titanium alloy because this metal does not adversely interact with biological tissue. After placement of the implant a cover screw is put in and the wound is closed with stitches and allowed to heal. In general, placements in the lower jaw need to heal about three months, while placements in the upper jaw need to heal about six months. After healing, in a second surgical procedure, the implant is uncovered, the cover screw is removed, and a healing abutment or a temporary crown is placed in the implant. Temporary crowns are generally used for esthetic reasons, when the implant is in a place that is visible. Both healing abutments and temporary crowns allow the tissue around the implant to be trained to grow around the final prosthetic tooth. After about two months the soft tissue will be healed to receive the final prosthetic tooth. Impressions are used to make custom abutments that take into account the neck morphology of the implant. The prosthetic tooth is sometimes attached to a gold cylinder that can be screwed into the abutment or it can be directly cemented onto the abutment. This multi-stage process, where the two surgical procedures are separated by a lengthy healing time, has proven to provide excellent stability in the final implant. Single step surgical implants are available, but some stability of the final implant is often lost by eliminating the healing step. At the first appointment, the dentist or oral surgeon performs a thorough examination to determine whether implants are appropriate to replace the missing teeth. Often, x rays are necessary to discover the state of the jawbone, particularly if the teeth have been lost for some time. This information is used to determine if implants are appropriate and, if so, what particular type of implant would be best for the clinical situation. There are two solutions commonly used if the initial examination indicates that the bone in the area where the implant is to occur is too resorbed to support the implant. The first is bone grafting . This involves undergoing a procedure that moves bone from one place in the body to another to enlarge the bone structure at the implant site. Often, bone can be moved from one place in the mouth to another. Sometimes a graft from a donor or an animal or artificial bone can be used if bone from the patient is not available. Grafting usually is done four to eight months before the implant procedure, to allow the graft a chance to heal before it is disturbed with the implant process. 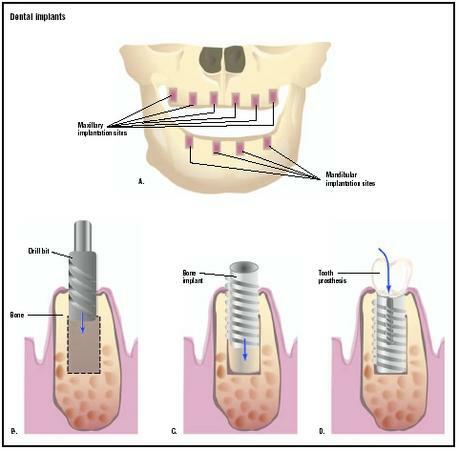 A second solution is the use of subperiosteal implants that ride above the bone but beneath the gum. These types of implants are not placed in the bone. A CT scan is commonly used to obtain a model of the bone structure and then the implant fixture is molded to precisely fit the bone model. The greatest risk following the surgical procedures is that the implant will fail. For implants placed within the bone, most failures occur within the first year and then occur at a rate of less than 1% per year thereafter. Recent research has indicated that tobacco use by the patient and use of a single-stage implant procedure are two risk factors that increase failure rate. Overall, the success rate for all implants runs from 90% to 95%. Most failed implants can be replaced with a second attempt. Balshi, Tom, William Becker, Edmond Bedrossian, and Peter Wohrle. A Patient's Guide to Dental Implants. Omaha, NE: Addicus Books, 2003. Wiland, Michael R., Michael Mastromarino, and Joseph N. Pipolo. Smile: How Dental Implants can Transform Your Life. Boca Raton, FL: CRC Press-Parthenon Publishers. 2001. Vehemente, V. A., et al. "Risk Factors Affecting Dental Implant Survival." Journal of Oral Implantology 28 (2002): 74–81. American Academy of Implant Dentistry. 211 E. Chicago Avenue, Suite 750, Chicago, IL 60611. (312) 335-1550, Fax: (312) 335-9090. http://www.aaid-implant.org . American Dental Association. 211 E. Chicago Ave. Chicago, IL 60611. (312) 440-2500, Fax: (312) 440-7494. http://www.ada.org . Implants can be done by dentists, periodontists, or oral surgeons. The procedure is done in the dental professional's office. What are the expected benefits of dental implants and what are the chances of receiving these benefits? What are the expected risks of dental implants and what are the chances of suffering from these risks? How many procedures like this have you done previously and can I talk to any of these patients? There are basically two types of implants. Those that are placed on the jaw bone, but under the gums, and those that fit into the jawbone similar to the root of a natural tooth. Each type offers solid, non�mobile support for replacement teeth which act and feel like natural teeth. Since both types are attached to your jawbone they can provide distinct advantages over traditional methods of replacing missing teeth. �	Implants restore proper chewing function and so you can enjoy foods previously too �Difficult� to eat. �	You feel confident that your replacement teeth won�t move or loosen. �	You regain the closest thing to the look, feel and function of your natural teeth. �	Throw away those sticky adhesives. �	Forget about unsightly partial denture clasps which place damaging pressure on remaining natural teeth. �	Eliminate irritated and painful gums. �	Improve your speech by eliminating or reducing the �Fullness� of full or partial dentures. �	Replace missing teeth with the look and feel of natural teeth without having to �Cut down� healthy teeth. �	Dental implants help stop the progressive bone loss and shrinkage of your jawbone by �Mimicking� the roots of natural teeth. �	Dental implants are clinically proven with a success rate in excess of 90%. I lost my two front teeth in an accident around 2 years back. But I am wearing dentures now. Norw I want to go for tooth implant. Is it too late? Is the jaw bone shrined back by such a large time? In November I had, I think, the #2&3 molars removed from my upper right teeth. I have no wisdom teeth but all others are intact. I've had gum surgery in all quadrants in 1993 and again in November,2011. I have some bone loss and some gaps between teeth. They are all fairly tight especially my front upper and lower 12 teeth, they also have no gaps and the gums cover them well. I'm 60 years old have no dental insurance that will help pay for this. My peridontist states I need a sinus lift ($1,800.00) (He ordered a panel) and 2 implants at $2,000.00 each. My teeth the way they are now feel good, do not cause any speech impediment even while singing and can't be seen. My questions are what will the benefits be to me and my mouth, and will they outweigh the risks? How long can you expect an implant to remain intact before it may require replacement? If I do nothing at this point, I have no missing teeth between teeth, only the #1,2&3 are gone, will it radically affect overall health, bone structure or tooth movement?. I can't wear normal dentures. It's impossible to keep them in my mouth. I endure violent gagging reactions. Every dentist I have approached tells me the same. Only implants will solve your problem. Here in Australia Medicare is not willing to participate in the expenses, although it is a health issue. Can I have the procedure done overseas? Countries such as Thailand etc? Nowadays itz very good to the dental patients.